I will never forget the day I was accepted into Douglas Anderson as a freshman, a fresh teenager, a creative writer. I expected to learn about imagery or symbolism or whatever colleges were looking for at that point, but didn’t anticipate how important a community can be towards honing my writing skills. The experience that I have gained as a result is nothing short of invaluable. Class activities were surrounded by group critiques and group discussions. 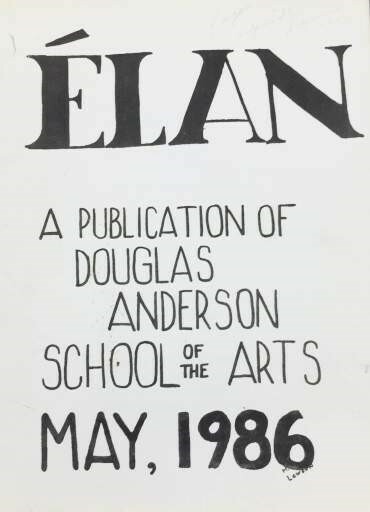 When my submission was accepted into Élan, I was offered a glimpse into the inner workings of the magazine, and the staff who critiqued my piece to help it get to the place it needed to be. I saw a force that was indestructible: teamwork at its finest. This, I thought. This is what I want to have. And so the years have offered me such as I have wanted. If I need help with a piece due the next morning, I can text a classmate and they will offer me points for revision. If I need help with a piece I have written on my own time, I come to the same group. And, with my entry into the Élan staff, I have found the community of editors to be all I desired and more. There is always help offered, and there is always a person at your side who understands. It is a horrible feeling, to think of a future where I do not have the connections I possess now in terms of accessing writers who can help me further my work, and vice versa. Consulting writers is the foundation of how I write; I need unbiased judgement on the pieces I’ve drafted five times. I need fresh eyes on the pieces I don’t know how to finish. Community has changed the ways I write for the better; community is essential to writing. After all, how would Élan have begun if not for such a strong foundation of writers?